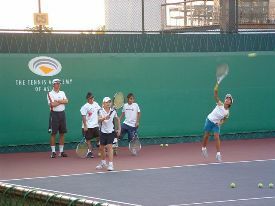 The tennis training program here is very similar to how top juniors in Europe train from the ages of eight to 14 years. The program consists of five major parts, each of which is crucial for the development of a nationally ranked tennis junior. 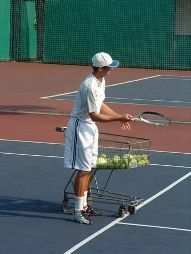 Tennis training consists of approximately 10% instruction and 90% repetition. Repetition of strokes and playing patterns is necessary to make them subconscious and automatic. In a typical tennis match, a player has no time to think about technique or analyze the situation in the 1.5 seconds it takes for the ball to come to them from the other side. And even if players attempt to think about technique, they will devote most of their brain processing power to this thought process and less processing power will available for extremely complex and fast calculations such as ball speed, timing, and body coordination. Devoting too much time to thinking about technique or strategy will, of course, result in MORE errors, not less. As the main purpose of tennis training is to make all strokes and most playing patterns automatic, young players need to repeat the strokes and patterns thousands of times. Instruction is no longer needed after the player has learned the fundamental information about the strokes and playing patterns (only a few reminders here and there); that's where the group lessons with lots of drills come in. Group lessons provide players with competitiveness and fun, and they are much more cost effective. Group situations allow the coach to create new and interesting drills while still focusing on repetition. Players also show more effort when they compare themselves with each other and compete in a group. This also allows players of the same level to push each other to the limit and improve much faster than they would in the non-competitive environment of private lessons. The main purpose of private lessons is to learn new strokes, improve or correct technique, and learn new playing patterns. The main advantage is that players can be totally focused on a certain task without being distracted by other players, which often happens in group lessons. 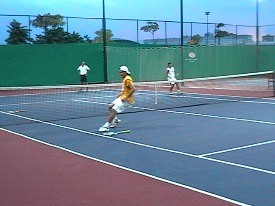 Players also get to hit more balls in a short period of time, which is necessary for learning and acquiring the fundamentals of tennis technique. Private lessons also allow the coach to focus on the most important part of training for a particular player (for example - correcting the backswing of the serve). This becomes more difficult in group lessons since the coach must create lesson plans that will benefit all the players in the group. Tennis parents often think private lessons are better than group lessons but this is only true when it comes to learning new techniques or correcting mistakes. As mentioned above, this makes up only about 10% of tennis training. If a coach has to work on repetition during private lessons it is not only a waste of money, but also a waste of the coach's time and knowledge. The coach's knowledge is better served addressing the weaknesses of the particular player. A private coach is like the architect of a building. Architects are not paid to put bricks on bricks; for this there are less specialized workers. It's the same with private coaches: they need to overview the process, make sure the house (player) is built in the right way, and concentrate on the crucial parts of the building process. The less specialized workers, in this case tennis coaches in charge of group training, must make sure strokes and playing patterns are repeated many times with high intensity training. Tennis is an athletic sport that involves sprints at maximum speed, quick reactions, explosiveness, quick changes of direction, and endurance to sustain long matches. Player who are not physically fit, fast, strong and able to play for two or more hours without getting tired have no chance of competing in national or international levels above 12 years of age. Many different kinds of skills are needed for players to be able to play tennis well: coordination, balance, flexibility, hand-eye coordination, reactions, speed, stamina, strength, and agility. If players want to play high-level tennis, they will have to move their bodies in ways that are not often practiced in regular tennis training. Physical training allows young players to develop a large motor base of various movements and skills which will then be used in non-standard and standard tennis situations. Group training is better for this purpose since the players can work together, challenge each other, put more effort into exercises, and, of course, make sometimes boring physical training much more exciting. Another reason why developing motor skills (coordination, speed, reactions) is so important at a young age is because these skills develop faster from eight to 16 years of age. This window of opportunity last for only a few years when players can develop the potential for quick sprints, hand-eye coordination, fast reactions, and other skills. Can't these skills be developed through playing and tennis training? No, because junior tennis at eight to 14 years of age doesn't require many fast sprints, explosive starts or quick reactions. The players play slower and the winner is typically the player who doesn't miss much - so there is not much risk hitting fast balls. The serve is also very weak compared to the speed of adults serving at full power. At the age of 16 and later, players start playing and serving much faster but then it's already too late to start working on speed, coordination, reactions and other skills. These skills must already be well developed at a young age because they will improve only by a small margin every year after that. Developing physical skills and abilities is the most important part of training for children under 10 years. After that, physical skills will take a back seat to group lessons for the remainder of the player's career. Successful players under 12 years of age are typically those players with better strokes who have played and trained more than the rest. After 12, the mental aspect of tennis becomes more and more important. Players need to learn how to control their emotions, their thoughts, how to calm down when they are nervous, how to build confidence, how to keep concentration throughout the match, and many other mental skills. Countless match and player-specific situations need to be explained and dealt with when players encounter mental challenges. Some examples of these mental challenges include playing a higher ranked player, playing a lower ranked player, playing the finals in front of a crowd, coming from behind to level the score, taking advantage of a lead, dealing with gamesmanship, winning a set, and dealing with let downs. An experienced coach helps players to understand the mental aspects and challenges of each situation and shows players ways of thinking and behaving to overcome them. Players who are not properly guided will usually blame themselves for the lack of success in these situations and create negative beliefs about themselves. These negative vibes will then block the player from reaching a higher level. For example, if a player loses against the number-one seed of the tournament because he overestimated his opponent's level of play, this can cause a negative belief - way of thinking. "I can never beat the number-one seed player since he is too good for me." Or: "I always play poorly against the number-one seed." The player will then subconsciously behave and play in accordance to this negative self belief, which was created by overestimating opponents and underestimating their own ability. Such negative beliefs are extremely difficult to change at a later age and must be prevented from happening as early as possible. A junior player who has learned various mental skills and is also mentally tough will have a huge advantage over typical adolescents who cannot control their emotions. The mental game is the key to succeeding in top-class tennis today. Playing many different opponents will teach players how to master the stragetic part of the game. Every opponent is different and every opponent will present a different challenge. It is impossible to prepare for all of these challenges in training sessions. Playing tennis matches will help players to gain experience and match toughness. Players will learn how to outplay and outmaneuver opponents, find their weaknesses and exploit them, use their own strengths to make the best of them, and eventually become masters of the tennis game. As you probably agree, competitive tennis consists of thousands of good hitters but only a few really good players. Learning from experience (of wins and losses) is the ONLY way to become an expert tennis player, whether this is at club level or at a world-class level. Players should have around a 40:60 to 60:40 win/loss ratio to learn from mistakes, learn from what works well, play tough opponents, play weaker opponents and other situations. Winning matches is important for players to build confidence in their abilities and to learn what works well. Losing matches is a normal part of competitive tennis and players need to learn from their failures and accept them as part of the game. Following this five-part tennis training plan for tennis juniors will definitely give your child the edge over the majority of other tennis players. It will also help your child to become the best possible tennis player they can be. And this should also be their ultimate goal: feeling good about themselves for having mastered one of the most difficult and rewarding sports on the planet.